Come and join us in Cozumel for a great eco-tour that includes horseback riding through the jungle and also a canopy adventure, all of this in a two acre eco-park. Ride on one of our docile horses, along through the park's trails and at a point you will have the chance to run your horse if you desire. This tour allows you to experience the local flora and fauna of Cozumel. 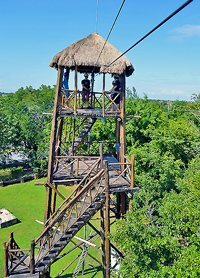 Once your land adventure is over, get ready to gear up as you hear the safety briefing and instructions and then it is time to climb one of the canopy towers, you will go up 60 feet above the ground to start a great thrilling experience. Get ready to fly over the tree lines on a series of zip lines, on a circuit over 3 kilometers long. You'll have the chance to canopy solo or if you have small kids you can tandem with them for a great family experience. A magnificent experience in Cozumel is waiting for you! Ride your horse through the Mayan Jungle! Have the chance to trot, walk or even run with your horse! Enjoy magnificent views from atop our towers! A great chance to canopy tandem with your kids! Where: The ranch is located at KM 3.8 Carretera Transversal, Cozumel. Exact meeting instructions will be included in your confirmation. Kids: Ages 7 years old and up. Kids same price as adults. Restrictions: Pregnant women, people with severe heart, back, shoulder, or knee problems will not be able to participate in this activity. Weight limit for extreme activities is 300 lbs (150 kg). Taxis are lined up waiting for you as you get off the ship. Very easy. Should cost only about $9.00 USD from the Punta Langosta pier and $4.00 from the International and Puerta Maya piers.